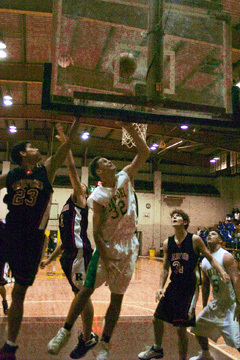 Beau Albrechtson of Kaimuki scored two of his 11 points against Radford just before the end of the first half. With the luxury of a first-round bye, No. 10 Kaimuki used the extra rest to jump on Radford early and never looked back. Keone Reyes came off the bench to score a team-high 14 points and Beau Albrechtson added 11 points as the Bulldogs never trailed in defeating the Rams 58-44 last night in the quarterfinals of the Oahu Interscholastic Association playoffs at Mililani. Gary Satterwhite, one of the top scorers in the OIA West this season, had 14 points to lead the Rams, but was constantly hounded by a tenacious Bulldogs defense. "We had a guy on him every second of the game and he still managed 14 points," Bulldogs coach Kelly Grant said. The Bulldogs (10-2) clinched their fifth straight trip to the state tournament with the victory, and will play Kalaheo, which beat Mililani last night, in the OIA semifinals Wednesday at McKinley. "We're looking forward to it," Reyes said. "The key tonight was we played good defense and we're just looking to keep it going." It was all Kaimuki from the outset as Thomas Pyo nailed the first of his three 3-pointers 3 minutes into the game to give the Bulldogs a quick 9-2 lead. The Rams cut the lead to three early in the second quarter, but Reyes scored six points as part of a 9-2 run that gave Kaimuki a 26-16 lead. The Rams would not get closer than eight points the rest of the way. "He's our most complete big man," Grant said of Reyes. "We're fortunate to have the luxury of allowing him to come off the bench. It gives him time to see the weaknesses in the other team's defense and go in and take advantage of it." "I love it," Reyes added about coming off the bench. "I do it for the team and I like giving a boost to my teammates when I go in." After committing just two turnovers in the first half, the Bulldogs came out rusty in the second half, turning the ball over five times in the first 4 minutes. But the Rams couldn't capitalize as they struggled to score. Only Satterwhite seemed to find any success, as he scored seven of the team's 10 points in the period. "I think we got a little relaxed at halftime," Reyes said. "But then Coach got on our butts and we pulled it together." A 3-pointer by Reyes with 7 seconds left in the quarter gave Kaimuki a 44-31 lead heading into the final period. The Rams could only cut the lead down to 12 before a three-point play by Albrechtson with 2 minutes left iced the game. "We seem to struggle at times early in the second half because the players have a hard time adjusting to the other teams adjustments," Grant said. "We've got a solid rotation of big guys to go with and the key to the game was they stayed out of foul trouble." RADFORD--Garriet Canteen 2, Justin Lord 7, Joe Brundidge 4, Zac Brisley 0, Gardner Nakatani 4, Jeremy Hayes 1, Matt Alofaituli 7, John Watson 0, Gary Satterwhite 14, Antonio Williams 0, Michael Goodman 5. KAIMUKI--Daniel Colon 6, Alika Higa 0, Craig Cabudol 0, Bryan Lim 0, Shaun Dela Calzada 4, Swaine Seto-Mook 0, Shadrach Ramos Dias 6, Thomas Pyo 9, Phillip Miyasaka 0, Keone Reyes 14, Jarrett Shiu 8, Beau Albrechtson 11. Marvin Judd scored six of his game-high 19 points in the fourth quarter as the Mustangs upset the Trojans to advance to the semifinals of the OIA playoffs and clinch their 17th straight state-tournament appearence. Kahua Hollinger added 15 points and Chris Tumaneng had 14 for the Mustangs, who converted 14 of 21 free throws in the fourth quarter to hold on for the win. AJ Clark scored a team-high 17 points and Ken Moses added 14 for the Trojans, but both players fouled out. KALAHEO--Elias David 8, Chris Tumaneng 14, Kahua Hollinger 15, Jacob Anderson 0, Marvin Judd 19, Cheynne Lishman 0, Jeff Whitworth 2, Chase Moses 6, Cliffton Pires 1, Tyler Caswell 9, Mana Guerreiro0, Deaux Burns 0. MILILANI--Nick Kanno 0, Jordan Torres 8, Ken Moses 14, Jon Vasquez 2, Donovan Olmos 13, AJ Clark 17, Josh Cole 0, Darnell Johnson 0, David Otte 0, Brandon Dela Cruz 2, Kristian Guillen 4.